Within Canvas @ Yale, the use of Quizzes can be effective for exams. Canvas provides a plethora of features that provide the instructor with opportunity to emulate the limitations students would have if they took the exam in class. This document is designed to assist instructors to understand what each option in Canvas Quizzes means and how they can use them within their course to deliver exams. Draw your quiz questions from a pool of questions. Randomize question order (must use Question Groups feature). Update question banks for each course iteration. Randomize answer choices for each question. Display one question at a time. Enough time should be given so that students can answer the question without aide of a textbook or Internet resources. Have the assessment accessible only for a specific amount of time (for example, available on Friday at 5pm and due on Sunday at 9pm). Routinely review start and end times for exams to identify anyone who takes an unusually brief period to complete an exam. Release the student's test score after the availability time has ended (use the “Mute Assignment” feature in the Gradebook). Release results to the students after all students have taken the exam (use the “Mute Assignment” feature in the Gradebook). Time Limit [B]. You can choose to set a time limit by entering the number of minutes students must complete the entire quiz. Timed quizzes begin once a student begins the exam and will not be paused if the student navigates away from the quiz. An unfinished timed quiz will be automatically submitted when the time limit expires. If no time limit is set, students will have unlimited time to complete the quiz. Multiple Attempts [C]. You can allow multiple attempts. Recent Quiz Score. You can choose whether to keep the highest score, latest score, or average score of all attempts. By default, Canvas will keep the highest score unless this setting is changed. Allowed Attempts. You can allow multiple attempts and limit the number of attempts. The default dashes represent unlimited attempts. Quiz Responses [D]. 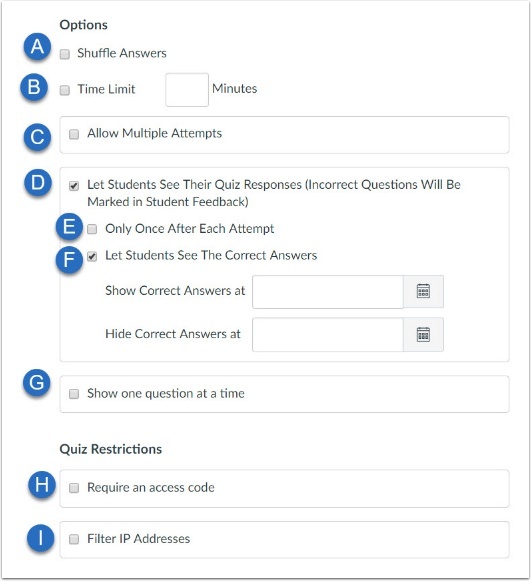 Allows students to see what they answered, any automatic feedback generated by the quiz for correct or incorrect answers, and which questions they got wrong. Quizzes default to this option, so if you do not want students to see their quiz responses, deselect the checkbox. As part of this option, you can restrict students view of the quiz results to Only Once After Each Attempt [E]. Students will only be able to view the results immediately after they have completed the quizresults include both their responses and the correct answers. Note: This option may not be appropriate for quizzes that require manual grading, such as essay questions, where students would require additional views to see the updated results. Correct Answers [F]. This setting enables a green correct tab on every correct answer for the entire quiz. Quizzes default to this option, so if you do not want students to see the correct answers, deselect the checkbox. To show answers immediately after quiz is submitted, leave the “Show” and “Hide” fields blank. To create a date range to display the answers, set a start date in the “Show” field and an ending date in the “Hide” field. To always show answers after a specific date, set a date in the “Show” field. To hide answers after a specific date, set a date in the “Hide” field. Note: If the “Only Once After Each Attempt” option is selected, it will override any show or hide dates or times. If you want to show or hide correct answers on any specific date or time, the Only Once option should not be selected. One Question at a Time [G]. You can show one question at a time and lock questions after answering. If you chose this option, you are provided the option to Lock Questions, which means you can choose to lock questions after answering. This option means that students cannot return to the previous question once it has been answered. Require Access Code [H]. You can require students to enter an access code to take the quiz. Filter IP Addresses [I]. You can filter IP addresses and require students to take a quiz from a specific computer lab. If you would like to meet with a Canvas @ Yale Support member to discuss the use of Quizzes your course, please use the Consultation link to do so.